MARLTON, NJ (August 26, 2016) – It’s an exciting time for Orpical Group, a full-service marketing agency that specializes in web design and development. 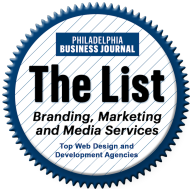 The NJ web design company made the Philadelphia Business Journal’s Branding Marketing and Media Services List, which features more than 1,000 of the best companies in their fields, by ranking. Schulz joined the team in 2012, bringing with him experience as a writer, designer, brand enthusiast and marketing professional. While many of Orpical’s clients use their services for marketing and web development needs, Chief Executive Officer Edward DuCoin said the heart and soul of the company is in the long-term partnerships it forms with clients. Future expansion of the company and its services is on the radar, as DuCoin and Schulz said they both aim to further promote their competitive advantages. One of Orpical Group’s local clients was Sheets Surf & More, a sheets, linen and beach towel rental and delivery company that services visitors to the Jersey Shore. Looking for WordPress Web Design in NJ? We can help. Orpical Group is a full-service marketing agency based in New Jersey specializing in web design, branding, creative strategy, operations and sales. Since 2012, Orpical Group has helped clients realize and sustain high levels of individual and organizational performance. To learn more about Orpical Group and their web design and development services, including WordPress web design in NJ, please email info@orpical.com. The Philadelphia Business Journal is part of the national Business Journal network. The Business Journals deliver to a total business audience of more than 10 million people via 43 web sites, 64 publications and more than 700 industry-leading events. The company, which covers business at the local, regional and national level, provides more national business coverage than any other business media organization.